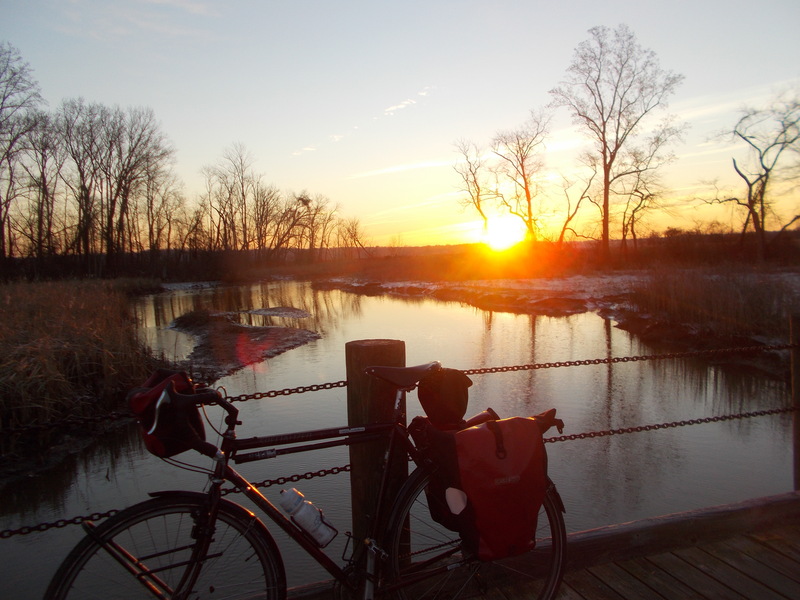 One of the joys of riding my bike to work is seeing the sun rise over the Potomac River. This morning’s did not disappoint. It stopped me in my tracks on the Dyke Marsh boardwalk on the Mount Vernon Trail. Despite temperatures in the 20s and a headwind I made it to work very comfortably. We were released early for the holiday and the ride home in daylight was a treat. It’s days like these that I so appreciate my commutes along the Potomac River. I am so lucky to have such a beautiful commute. My commute is my time alone. Sometimes my mind drifts. Other times I have a conversation with myself, often aloud to the amusement of commuters riding past. Call it meditation or therapy, I’d be lost without it. I’m not one for making New Year’s resolutions. I’ll ride a lot doing my utmost to avoid big metal things. Hopefully, I will hike a lot more. And, of course, root for the Nats. 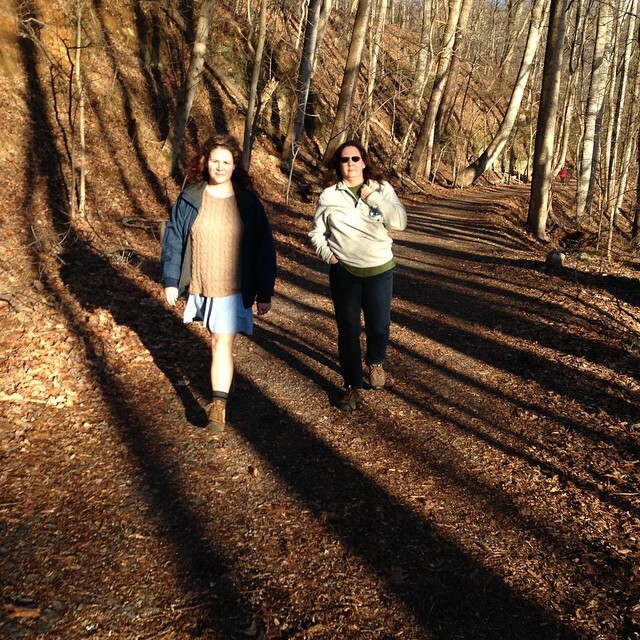 I do hope that my friends in the DC area join me on these adventures, as so many did in 2014. I intend to give 2015 everything I’ve got. You should too. Happy New Year and thanks for reading. Since my last (and first) acupuncture visit, I have purchased orthotic shoe inserts. They seem to help my back from getting stiff while standing. They also make my feet sweaty. You can’t have everything, I suppose. I rode Big Nellie, my recumbent, twice over the holiday. It made my right foot tingle and generally feel messed up. Yesterday I rode Little Nellie, my Bike Friday, to Old Town to meet some peeps who were having brunch. After brunch as I rode home I felt the peroneal tendon on my calf and foot snapping back and forth. This is not good. I told my acupuncturist about this. He asked me if I was having any other problems. I mentioned my lower back and my right shoulder and he went to town on me. His method involves squirting the area with a lubricant then massaging the area feeling for tight muscles. Basically, I am a gold mine of tight muscles. His examination amounted to a massage so I can’t say I was bothered by him loosening all my tight areas. While he did this he mentioned that I should take a magnesium supplement to keep my calves from getting all cramped. Not a bad idea. He pinned my hips, my middle back on both sides of my spine, my right calf (which he declared a mess), and my right foot. After about 20 minutes he took those pins out and went to work on my right arm and shoulder. The new areas (hip, back and calf) will need more treatments. Really? We were on the two and done plan last week. The fact is that one week after my first treatment my shoulder and arm feel much better. I couldn’t be happier with the improvement. My foot is getting worse by the day. In fact, I am starting to get concerned that if I don’t get it squared away soon, I might tear something and be up the bike path without a bike. So tomorrow I am calling a neurologist. I will likely have to wait a few weeks for an appointment. Then I will decide whether to do one more acupuncture treatment. Mostly that will depend on whether any of today’s treatments do any good over the next few days. This was a truly eventful year. I don’t normally talk much about my family here but today I will make a few exceptions. 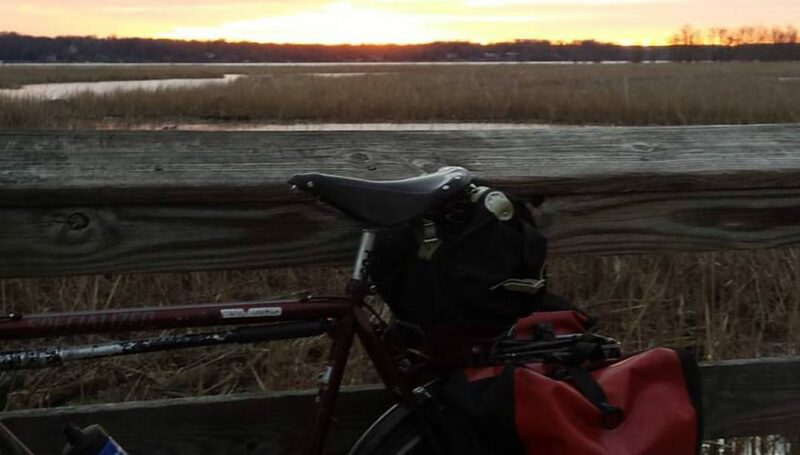 January: I have been a year-round bike commuter for several years now. Ice and snow are usually deal killers for me. This day in January was an exception. 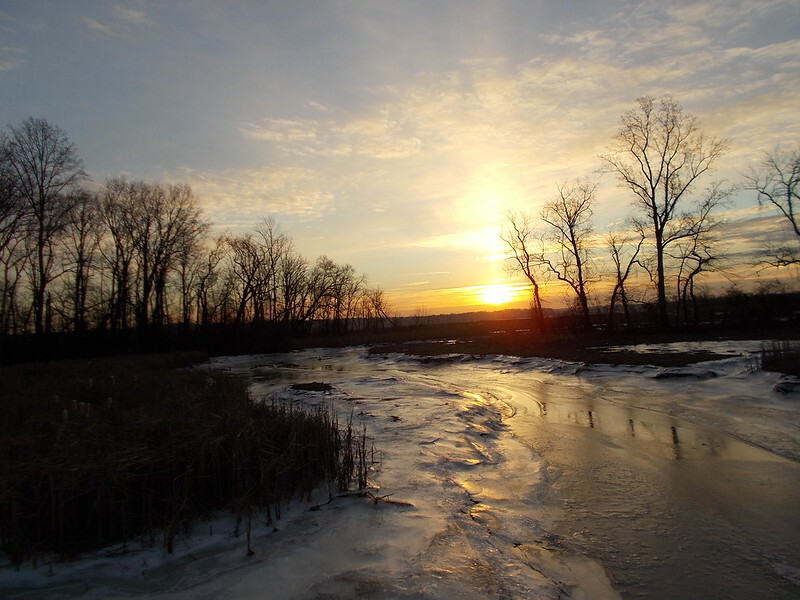 The frozen Potomac River at Dyke Marsh was beautiful. Even in the dead of winter, my bike commute is the best part of my work day. February: For most of the winter and spring, I was dealing with severe back pain. The weather gods did not cooperate by hitting DC with several snow storms. I decided to fight back; I bought a Wovel. 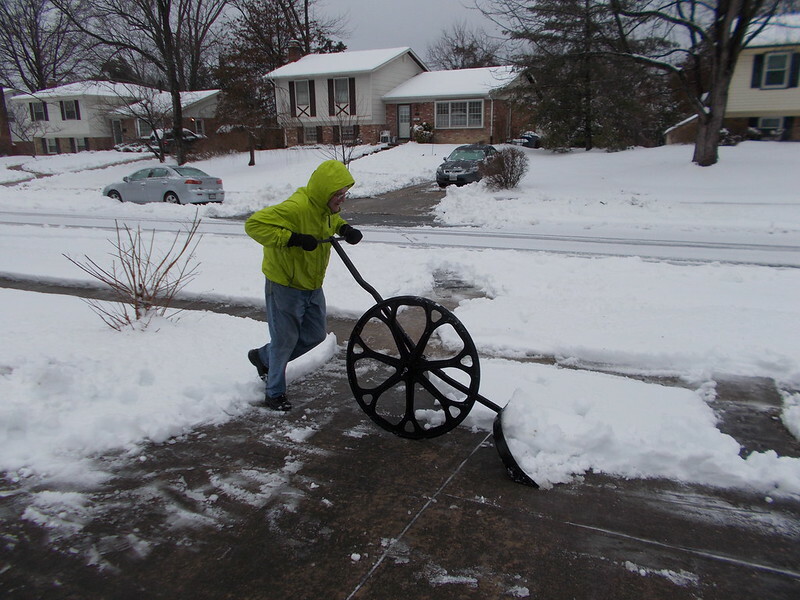 Damned if it doesn’t make snow shoveling enjoyable. And it didn’t bother my back one bit. 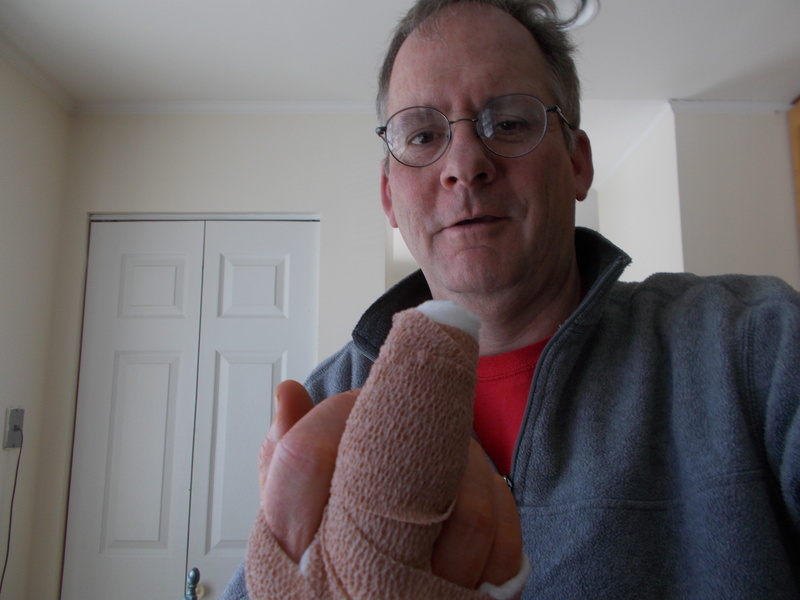 March: I finally decided to take care of recurring, painful cyst on my middle finger. It made for fun pictures. April: In 2006 I met Charmaine on the 50-States Ride in Anacostia. We’ve done dozens of rides since. 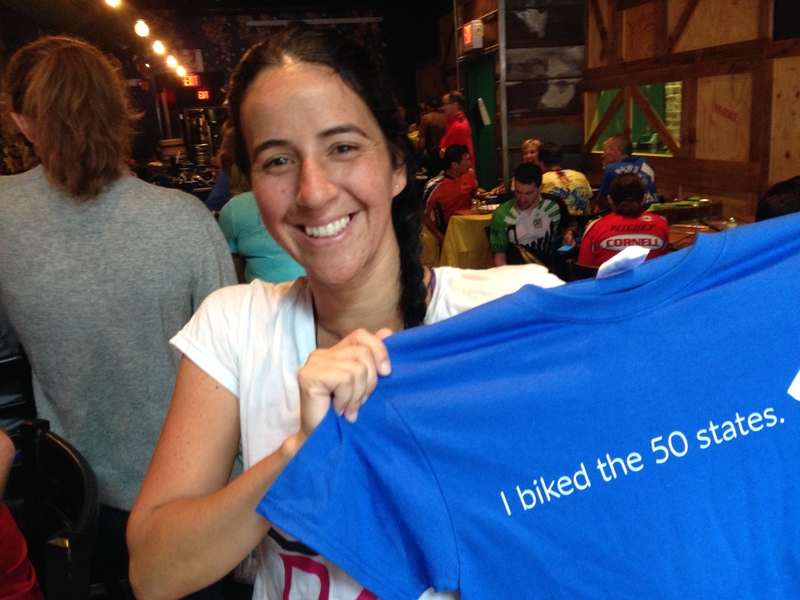 She got the idea to go to coastal North Carolina for a three-day bike riding event. 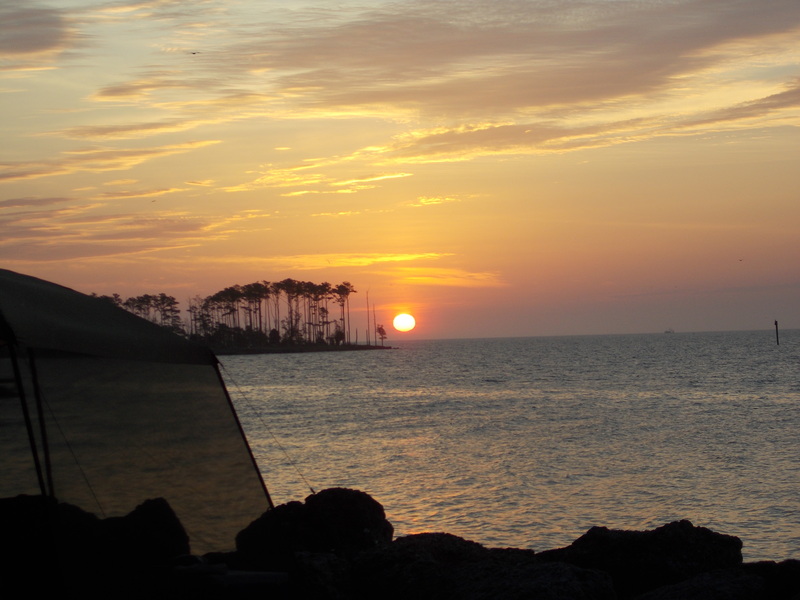 We pitched tents on the banks of the Neuse River. Sunrise was something special. 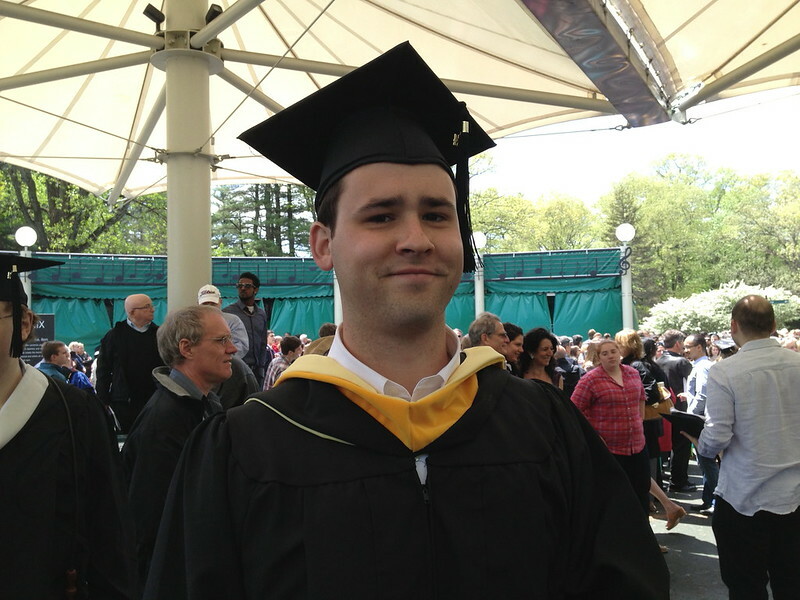 May: My son graduated from Skidmore College in Saratoga Springs, New York. After a summer job, he took off on the Great American Road Trip, which included a three-day hike to the base of the Grand Canyon. I am one proud and jealous papa. June: I was getting ready to start the 2010 50-States Ride when Mary came up and took my picture with Little Nellie. Sometime later, she, her husband Ed, Brian, and Lane launched Friday Coffee Club at M.E. Swings coffee house in DC. It has become a thing and has many imitators. I have been going nearly every week and have met so many great people. Here’s Brian, pre-coffee. You can tell by the fog. July: I really got into following the Washington Nationals. I love how the long season traces a story arc, something I first came to appreciate in 1975 when I was living in Boston. (Go Sawx!) 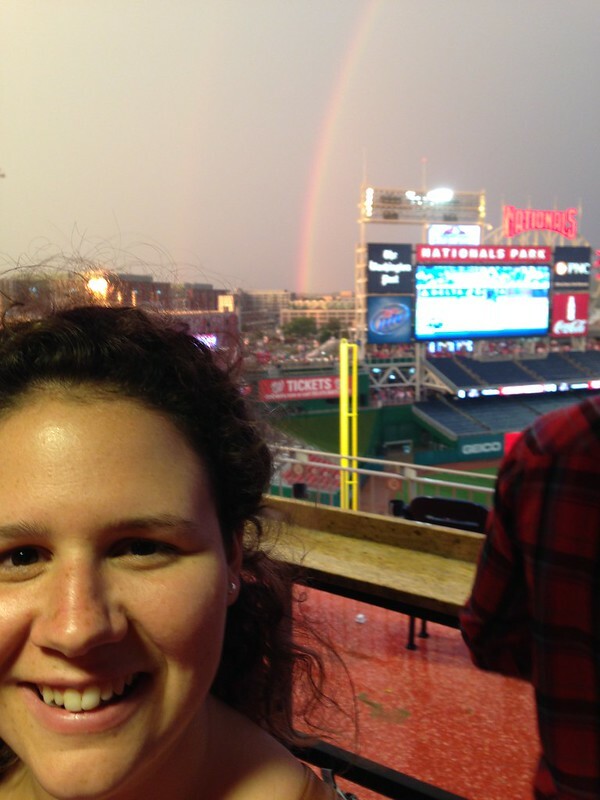 I took my son and daughter to a Nats game and it rained like crazy for hours. The game was called but we got to see this amazing rainbow. August: I started doing day hikes this year. I was a little too ambitious at first nearly killing myself by hiking the Billy Goat A Trail in Great Falls Park on a sweltering day. I’m still getting used to the slower vibe. 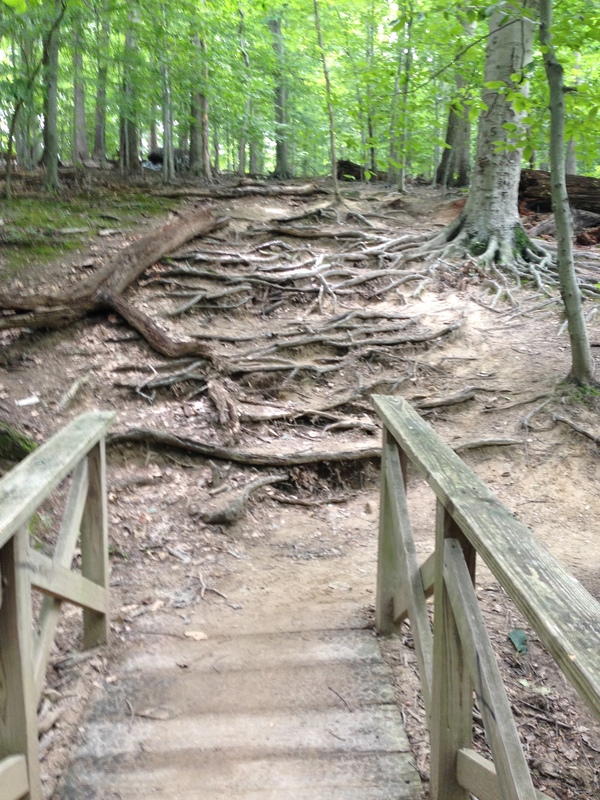 There’s so much to see, like this bizzarre series of tree roots from an 11-mile hike in Rock Creek Park. September: Early in the year, my friend Florencia returned from over a year and a half abroad. We made plans to do the 50-States Ride in September. She had to cancel but not before sending Emilia my way. Emilia blew me away with her enthusiasm. 65 hilly and rainy miles later she proudly held up her prize. October: Florencia and I spent many great days together this year, making up for the time she was away. In October, we took a golden retriever named Sundance to Sugarloaf Mountain in Maryland for a nearly four-hour hike among the changing leaves. Sundance had us worried as he wouldn’t drink any water all day. Here, back at the car, Flor watches with relief as Sundance finally drinks some water. Thanks for coming, Sundance. Thanks for coming back, Florencia. November: We always seem to have some interesting wildlife near our home. In the spring we watched kit foxes play in our back yard. 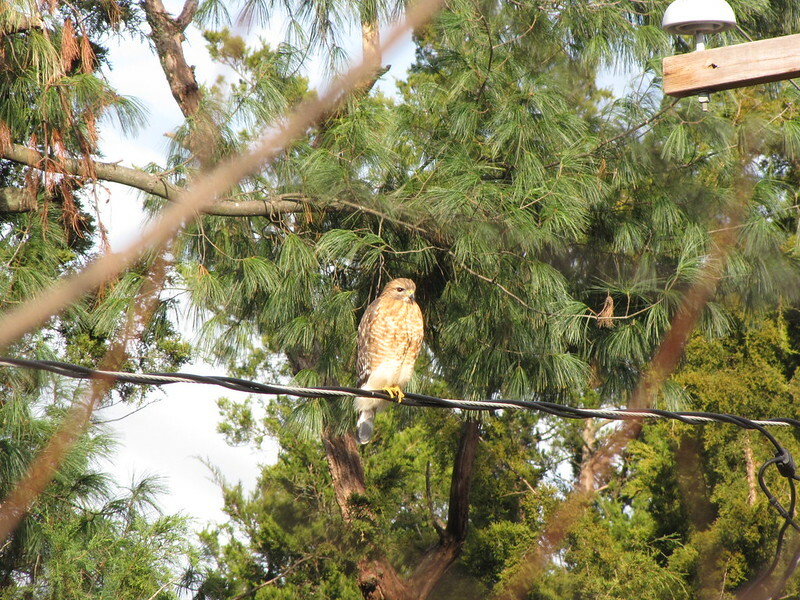 At the end of November this hawk stood guard over our neighbor’s house. December: Sometime in late November my right foot started to go numb. I suppose this is what I get for years of beating the bejesus out of my feet. I went to a neurologist who creeped me out something fierce. 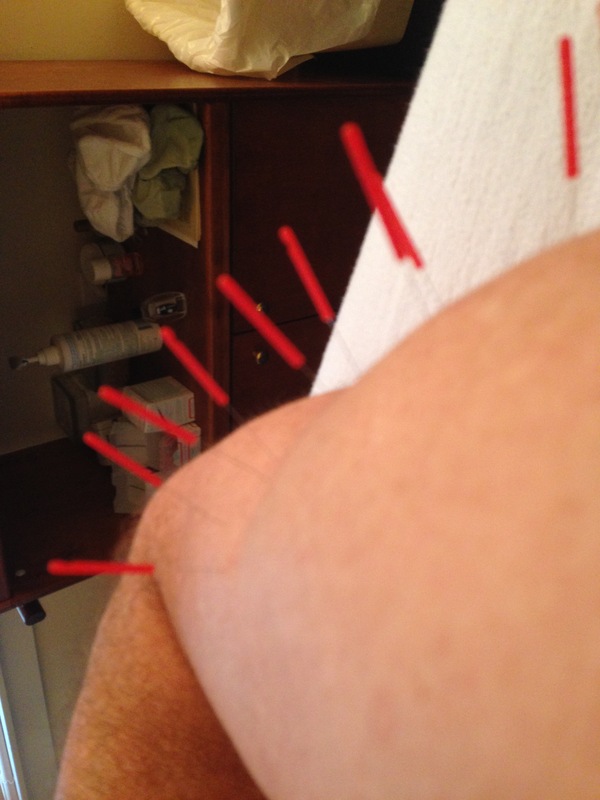 Then on the advice of Kirstin, with whom I cycled beaucoup miles this year, I went to see a sports acupuncturist. As of this writing I don’t know if the treatment worked but it was certainly an interesting experience. My younger brother Mike passed away in October. His death was not unexpected. I defy you to find a cuter baby or toddler, than he. When picture books gave way to word books, it was clear that Mike was dyslexic. Before the alcohol did its insidious work, Mike was a talented special ed teacher in upstate New York, turning his struggle with learning into a a gift for his kids. 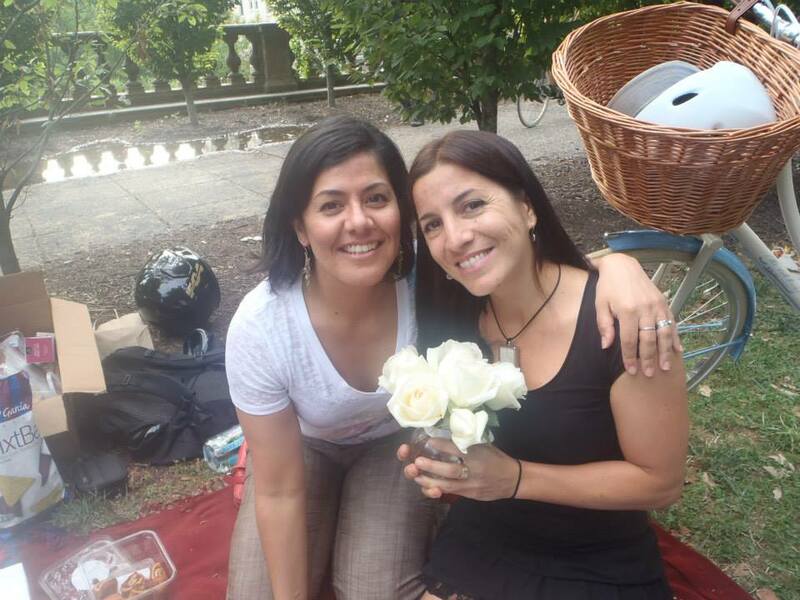 I learned of the tragic death of Lorena Gimenez, one of Flor’s dearest friends, in September. I had seen her just a few weeks before at Flor’s birthday picnic in Meridian Hill Park where this picture was taken. They were celebrating 15 years of friendship. Flor, as one of four “soul sisters”, gave a brief eulogy at Lore’s memorial service. It made me laugh and moved me to tears. About a month later, we learned that American University will award Lorena a Bachelor’s degree in International Development next May. Well done, AU. Congratulations, Lorena. Speaker after speaker at the memorial told of how Lorena comforted them in times of crisis and gave them some simple advice. 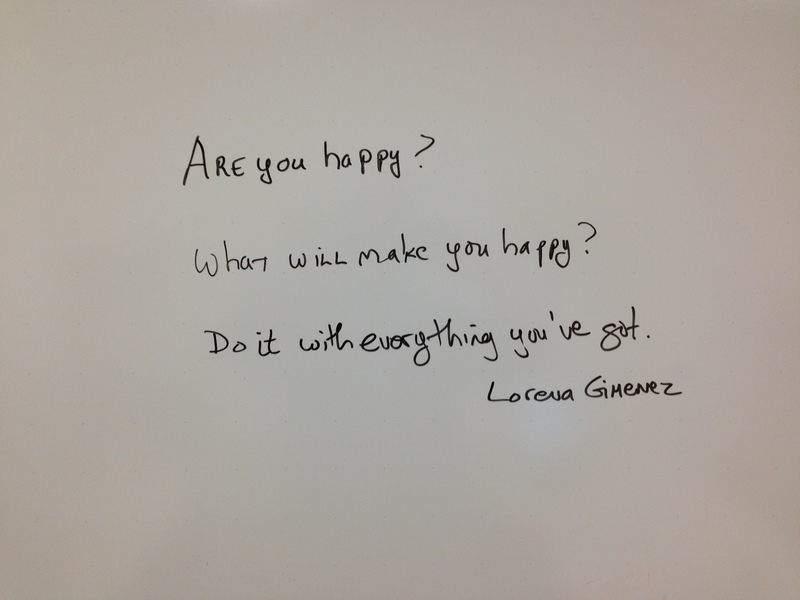 Her advice invariably boiled down to three sentences that I subsequently put on my white board at work. She died on the eve of her 42nd birthday. She was wise beyond her years. Last night I took my daughter out to the new District Taco in Old Town Alexandria. This place seems to be very popular with the #bikedc crowd. Unfortunately they do not yet sell cervezas at this location. I really wanted to try their fish tacos because my #bikedc friends rave about them. Sadly, they do not sell fish tacos on Mondays. I’ll just have to go back. The day after the acupuncture session I was surprised to find that the pain in my right triceps is still gone and my range of motion is normal. Pretty darn good if you ask me. I rode Little Nellie to work. When I started a misty rain was just ending. It was well before dawn. Not exactly the kind of weather to lift my mood. I only saw two people on the Mount Vernon Trail. One was someone I have seen before, maybe even at Friday Coffee Club. I’ll have to get his name because after passing me he seemed to fall into the same pace as mine. As it usually does, the ride did my head a world of good. Throughout the ride I tried to just let my mind drift instead of thrashing through the details of life. This is a challenge because if I succeeded at such an early hour, I’d fall asleep. Once I reached the Intersection of Doom I had to get my head back into the game lest I be run over by the motorized mayhem. When I got to work, my right foot felt normal. After a few hours it reverted to something between numbness and buzzing. I still have a few days to go before passing judgment on the efficacy of my treatment yesterday but at least there is change. The ride gome was a fogfest. For the first mile on the Mount Vernon Trail, I could barely see ten feet in front of me with the fog and headlights. It seemed like I was alone on the trail then suddenly NINJAS! An elderly (okay, wait, they were probably my age) couple was walking side by side. I hit my brakes and swerved for the grass. I stopped short of the grass and only a couple of feet behind them. “WHOA! I can’t see you.” Brakes squealing. I swerved around them thankful not to be in a heap of bike and bodies. The rest of the ride home was in solitude. It was pretty freaking nice for late December. South of the Beltway I was cruising along when I saw something surreal ahead. It was the most intense headlight I have ever seen on a bike. I am pretty sure it was a bike light or maybe I was having a near death experience. I arrived home with singed retinas. I am looking forward to the 60 degree weather forecasted for tomorrow. I can live without the forecasted thunderstorms. Christmas Eve in DC. Having seen the world’s creepiest neurologist, I figured I might as well go all in on the bizarre. 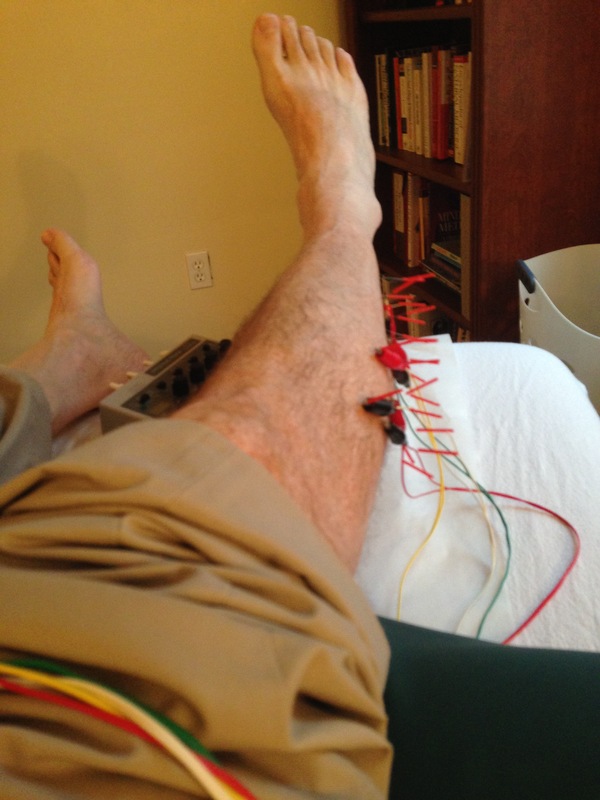 I went to see a sports acupuncturist. He came highly recommended by Ultrarunnergirl. She said he cleared up her plantar fasciitis with one treatment. I remained skeptical but for a nominal fee I figured what harm could be done. I sat down in the examination room and discussed my foot problem with the acupuncturist whomI will call Pokey. Pokey listened to me then pulled out a book and quickly found a page with a drawing on it depicting my problem. Well, whaddaya know about THAT! He then showed me a picture of the peroneal nerve which runs along the outside/back of the calf straight into the numb area and toward the pinky toe. I explained that mine felt like a guitar string and he said he knew pretty much exactly what was wrong. Then he asked me if there is anything else bothering me. Well, the true answer is my left knee, my lower back, and my right tricep. I decided to tell him about my tricep. “Okay, let’s see if we can fix that while you’re here.” Go for it. I took of my shoes, socks, and shirt and laid face up on an examination table. In short order he was massaging my tricep to determine where the needles would go. I figured he’d put one or two in but he went for broke and turned my upper arm into a pin cushion. I didn’t feel him put most of the pins in, only those ones that went into a tight bunch of tissue. Then he moved down to my calf. 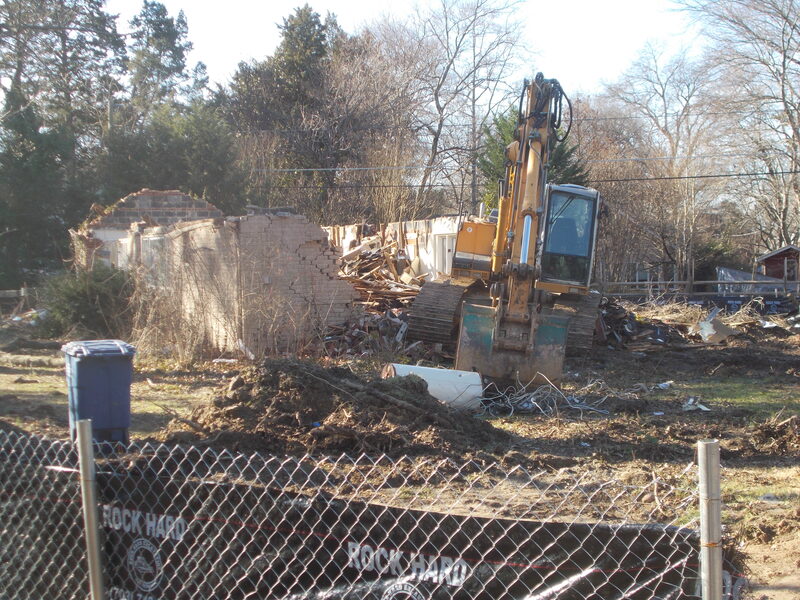 He went to town down there, finding all kinds of tightnesses. He asked me to tell him if the needles hurt but my leg reacted so much when it did that I couldn’t get “Ow” out of my mouth fast enough. Not that the needles hurt all that much. Just a bit. Each “Ow” elicited an understanding nod or comment from Pokey. Once he was done needling me, he told me to lie still for 15 minutes. I took a couple of pictures of his work. I was shocked at how many needles were in me. I didn’t feel half of them. Also a few needles were hooked up to wires. Out of curiosity I tried turning my foot. Ow! Not a good idea. Lay still dummy! When we were done he said that he thought the treatment would take completely in about 4 days. (Younger people take less time, he said.) I don’t notice much difference yet in my foot but my arm is distinctly better. This may just be a placebo effect but I’ll the reason seems irrelavant. It’s better. When I asked him about Rolfing he was somewhat positive. Basically Rolfing works on the some of the same principles as acupuncture. Acupuncturists find the troublesome nerve or tendon and they used needles to free it up. Rolfers use a sort of targeted deep massage. Rolding can hurt but it also gives you the benefits of a massage. So it’s still on the list of possibilities for me. Pokey said that he could probably make my lower back feel better but I seriously doubt it. In any case, I’m going back next Monday to see if we can get the foot better. He sounded very confident that 2 treatments would fix it. Women and bicycles have been very, very good to me. And I wanted to get out of the house and see some of my #bikedc friends. As luck would have it WABA was putting on its annual Hains Point 100 ride to benefit its Women & Bicycles program. What a remarkable coincidence. 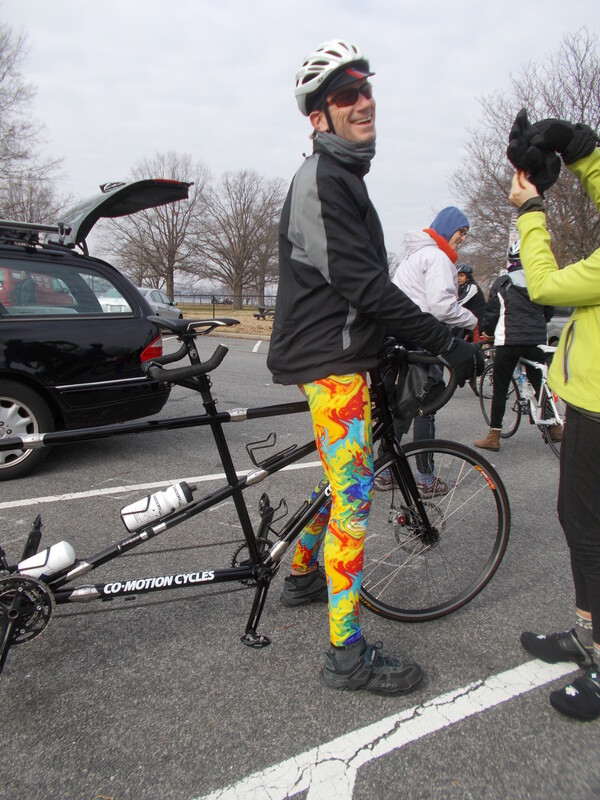 The event involves riding the 3 1/3rd mile loop in East Potomac Park, known locally as Hains Point, mostly because the loop goes down to Hains Point and back. I arrived about 15 minutes after the start and as I drove into the park there were about 100 cyclists streaming down Buckeye Drive. I parked the car, extracted Little Nellie from the trunk and joined the masses. Or, more truthfully, watched as the masses swarmed around me a speeds I could not match. I rode with Aaron Hansen for a lap or so. We were passed by swarms of cyclists that included Chris Mamone, Ed Felkner and Mary Gersima on their tandem, Dave Salovesh and Jean DeStefano on their tandem, Ricky Albores, Katie Bolton, and Ted Nigrelli. Aaron dropped out and I soon found myself riding with Kathy Lewis for several laps. 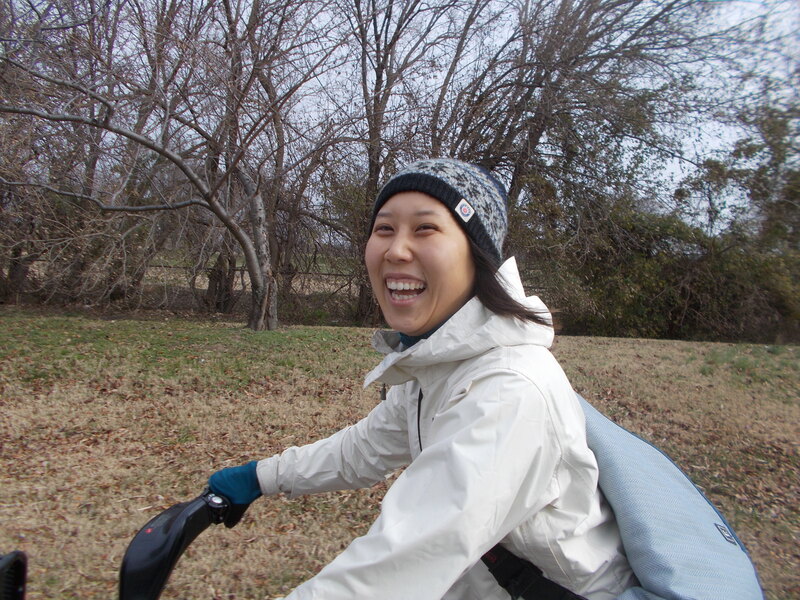 We managed to meet up with Crystal Bae who was riding a Bikeshare bike. Crystal and her husband Adam left DC for Santa Barbara about 1 1/2 years ago. They rode their bikes to California. It was great seeing her. I had hopes of seeing Alex Baca, another #bikedc expat in California, but, alas, she was a no show. No wonder Kid O doesn’t want to be seen in public with her dad. I stopped after 20 miles to make a donation to WABA. This led to a whole bunch of chit chat with Mike Ross and Lisa Eaker and their daughter (who is lovely but who’s name completely slips my mind.) And Ricky. And Dave and Jean. And on and on and on. I even spotted a young Cannon (Jeremy) lingering about. I decided to call it a day and head back to my car. During this last mile or so of riding I could feel a nerve or tendon or some other structure in my calf flexing like a guitar string and sending little shocks into my numb foot. I do believe I have found the culprit of my foot woes. Tomorrow I go to the acupuncturist. If that doesn’t work, a rolfing I will go. On the drive out of the park I ran into (not literally) Justin Antos. With Justin, Ed, Mary, Mike, Lisa, Jeremy, and Michael it was a bit of a 50 States Ride reunion. Here are some pix from today’s event. 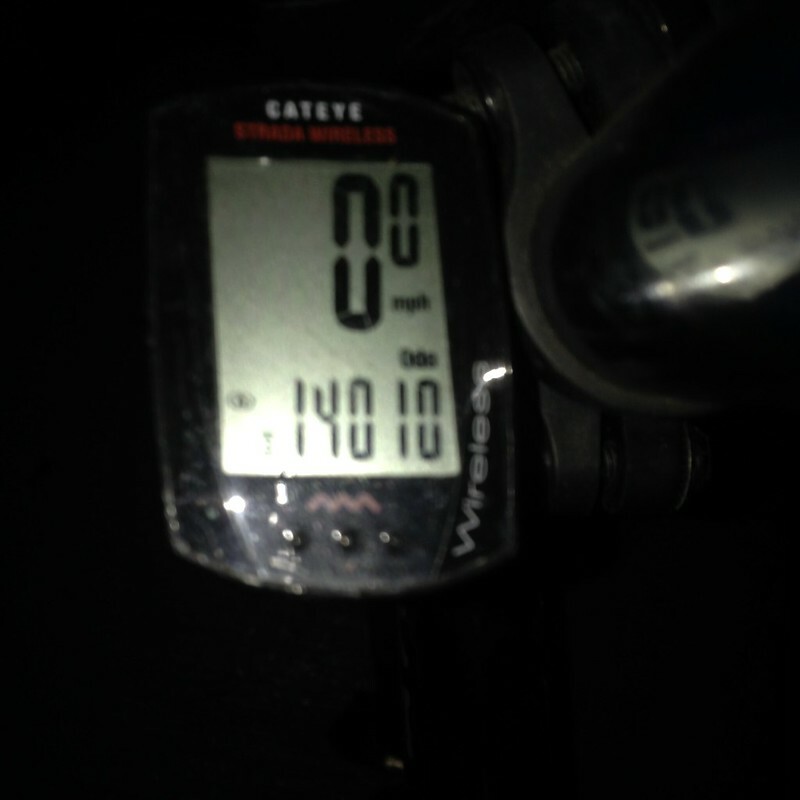 Today marks the bike commute with the least amount of daylight. As someone who is vitamin D deficient, I say, “Enough already.” I could do without the cold weather too, but, alas, that promises to get worse before it gets better. Curious to find out how the other half lives, I checked the temperature in Buenos Aires at noon today. 93 degrees (Feels like 104). Suffer, Argentina. 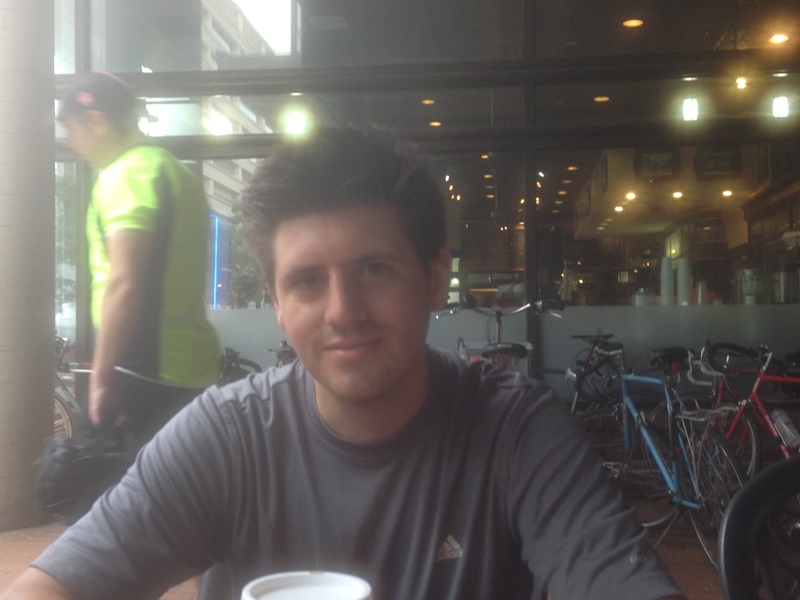 I rode to Friday Coffee Club talking to myself the entire way. I am a chatty person. The folks with the white coats didn’t catch me. At Swings House of Caffeine, there was a decent sized crowd. Felkerino brought cupcakes and @BobbiShaftoe bought Christmas cookies. I do believe there is a conspiracy afoot to undo all my good eating habits of late. For the record, I had one cupcake. Bob “Don’t Call Me Rachel” Cannon was disappointed that I was not wearing the earrings I won at the WABA Christmas party. For the record, I am not an earring kind of guy. @arlingtonrider brought Mac with her. Mac has been bike commuting for two months and is very enthusiastic. She fit right in with the hapless gang of two wheeled loonies. On the way to work I checked the odometer on Little Nellie. I never, ever thought I’d ride this bike so much. Yesterday, I weighed 203 at the doctor’s office. I suspect a vast right wing conspiracy. So I weighed myself nekkid at work. 200! Mendoza line. Basically my trick is to avoid eating crap. Seems to be working. The last time I was under 200 pounds my son was an infant. He now towers over me. I can’t say I was looking forward to the ride home. I was tired. My back was achy. Once I got on the bike though it all worked out. It was such a lovely ride. The monuments were all lit up. The view never gets old. The car traffic was light so I didn’t have to fight the headlights all the way home.